Adobe’s new stock photo imaging service is very quickly becoming the number one imaging service available online for creative professionals. Everywhere you look, you see examples and guides about how to best make use of stock photos. They all mean well – you can use them for marketing, blog postings, brochures, and even on the cover of books. Is there a guide anywhere about how not to use stock photos? Let’s answer a few of these questions. You are allowed to use Adobe Stock photos for just about any creative project from book covers and reports to commercials and websites – even including print ads. If you look at the fine print, you’ll notice that you do not own the photo. You may download the photo. You may edit the picture. But just because you downloaded an image, it does not mean you’re the only one. If you were to download an image, there’s nothing to stop me from downloading the same image. Notice I said ‘just about’ any creative project. I did not say every creative project. Logo creation is out of bounds for two reasons. One, the image does not belong to you. Two, you will lose instant credibility when they see a photo that you used for your logo somewhere else. Adobe does not offer exclusive licenses. That’s the kind of license you would need for any photo you wish to use in your logo. Adobe has a section on the general restrictions they place upon your use of Adobe Stock images. 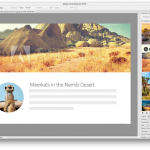 These restrictions are designed to protect Adobe in the contributing artists. For the most part, simply use some common sense in your use of stock images. Models, photographers, and graphic designers are all considered to be contributing artists for Adobe Stock images. To protect everybody, don’t use Adobe Stock in any way that puts any of their contributing artists in a bad light, such as tobacco ads or other adult related material. They are real people, and they deserve respect. Adobe Stock images, click here for review, are considered to be royalty-free. Do you know what that means? Simply put, it is a license that says once you have paid for your image, you may use it multiple times without paying and an additional fee every time you use it. It does not mean you own the photo. Additionally, there are still restrictions on how you may use the photo. In general, you may use the photo for personal purposes, including marketing. You may publish the photo on billboards, brochures, magazines, and even your own website – without giving credit to Adobe Stock. One of the restrictions placed on stock photos is your inability to distribute them. While you may use a photo you purchased as many times as you want, your colleagues may not – at least not without the right license. There are Extended Licenses that allow this type of use. Can you purchase a photo on behalf of a client? Of course you can – but there are still rules to follow. One of these rules says you can purchase one photo for one client. What you may not do is purchase one photo and use it for multiple clients. This is a violation of their distribution rule – you need to purchase a separate license for every client. Adobe has additional restrictions that are not part of their normal restrictions. For example Adobe claims to have royalty-free images, but did you know that the only two places you may re-create the image an unlimited amount of times is on your website or through a social media channel? If you intend on using the image for any other purpose other than those two, you may only reproduce it 500,000 times. This means you can only create 500,000 flyers, or use it on 500,000 business cards. If you still need to use it more than that, an Extended License is required. Another restriction prohibits you from using any images on templates. Generically speaking, a template is a type of form that people use to customize work as their own. An example might be a calendar. If you were to create a calendar template for distribution, you may not use any Adobe Stock image as this would fall under the violation of distributing images. Adobe Stock places limitations on the use of their images for very good reasons. They protect Adobe, their contributing artists, and you. When you are creating a logo – or any other original work for that matter – be original. The last thing you want to do is be subject to a lawsuit because you violated the terms of Adobe sets forth as a condition of using their images. There’s always light at the end of the rainbow. If you follow these rules, Adobe Stock can be a very enjoyable (and affordable) service. Adobe Stock changes the world through amazing digital experiences. Be a part of that world. Get Adobe Stock now!